This soup has a hint of earthiness from the celery root. Warm butter and oil in a medium saucepan over medium heat. Add onion and cook until soft, 10 minutes. Add celery root, chestnuts, thyme, and stock. Bring to a simmer, then cover partially and simmer gently until celery root is tender, 20 to 25 minutes. Purée soup in a blender in batches. Stir in 1 tsp. salt, 1/4 tsp. pepper, and 2 tbsp. cream. Whisk remaining cream into soft peaks. Season soup with salt and pepper. 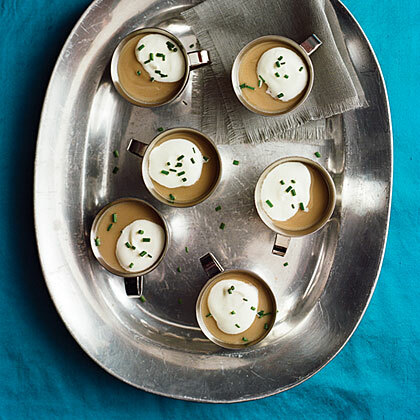 Serve 1/4-cup portions in espresso cups or teacups, topped with cream and chives. Make ahead: Through step 2, up to 1 day, covered and chilled. Reheat over medium heat.